During the past two decades, transcranial magnetic stimulation (TMS) has emerged as an important modality for the exploration of cerebral function and assessing the integrity of human motor pathways. In TMS, a strong magnetic pulse activates neural elements oriented predominantly horizontally to the brain surface, and a motor evoked potential can be recorded in the activated muscles. In single-pulse TMS, stimulation can be applied to different levels of the nervous system, including the spinal cord, to assist in localizing a lesion to a specific level and helping to characterize it as demyelinating or axonal in nature. A central motor conduction time can also be calculated; this is defined as the latency difference between the motor evoked potentials induced by stimulation of the motor cortex and those evoked by spinal (motor root) stimulation. 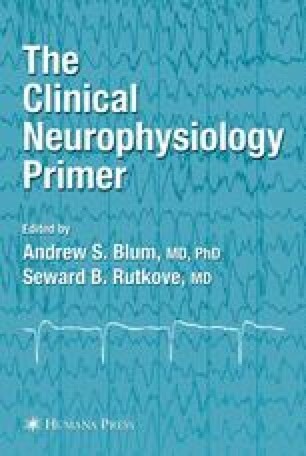 A variety of additional testing paradigms have been created over the years, including the use of paired-pulse techniques and repetitive stimulation, the latter potentially assisting in treating a variety of disorders, including depression and Parkinson disease.